A central part of my commitment to science is teaching and outreach. In addition to my TA responsibilities I have been fortunate enough to participate in a number of other outreach activities. 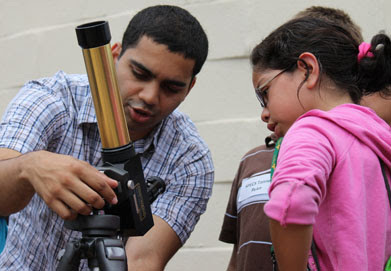 I am currently an American Astronomical Society Astronomy Ambassador – a program which has given me access to mentoring and resources that have helped me with education and outreach initiatives. From 2010 to 2012 I was a NSF GK-12 fellow as part of the SUNRISE program. As part of the program I spent two years assisting a teacher with and implementing science lessons at a high-needs elementary school. We also ran STEM intensive summer camps aimed at high-needs students. Additionally, I was able to travel with other fellows for a month long trip to India aimed at fostering research connections and allowing fellows to visit the variety of different schools in the Indian educational system. From 2012 to 2014 I was Manager of the GMU Observatory, where I planned and hosted dozens of private astronomy related events for a variety of different audiences. As part of my work at the observatory, I also curated a public series of lectures and observing. In the past I have also been a GMU BRIDGE Scholar. As part of that program I assisted international graduate students in STEM disciplines with their academic work and research. Finally, I’ve also participated in the VISTA program’s Elementary Science Institute where I created and gave lessons for a teacher professional development program.